A friend from high school called me up late last month wondering if we could do a trip overseas in July. My schedule had some flexibility to it so I started finding trips we could do on United MileagePlus miles. We were able to settle on Barcelona, Vienna, and a half day in London for 60,000 miles; a very good deal. The first leg of the journey was from Denver to Toronto to Barcelona. 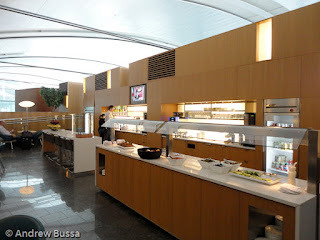 My friend was originating in Chicago and we planned to meet at the international Maple Leaf Lounge in Toronto. 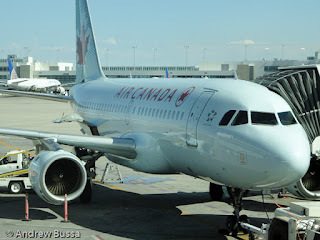 I was flying an A319 to Toronto connecting to a Boeing 767 to Barcelona. The Airbus part of my flight was great. 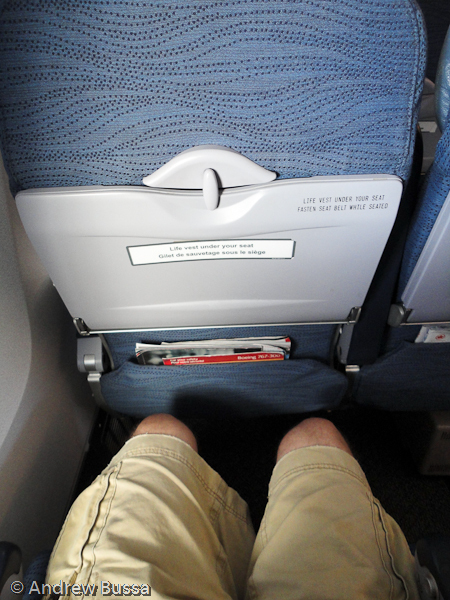 There was plenty of leg room and a FREE video on demand entertainment system. The system has a great collection of new and classic movies, along with games, a map, and music. I watched The Good, the Bad, and The Ugly. It happened to finish just as we were landing and made the flight go very quickly. The service was friendly too. The lead flight attendant looked like a jovial lumber jack that could be in tourism commercials. I also got a kick out of the bilingual announcements, as required by law, not the makeup of the passengers. After landing it was a quick walk to the transfers desk, stamp in the passport, and a quick walk to the lounge. To speed the trip, Toronto Pearson Airport has moving walkways that go faster in the middle than at the ends. It was my first time using them and it was fun to see the clever solution to an engineering puzzle. The Maple Leaf Lounge is on the second level (my friend walked right by it and spent a while looking for me on the departures level) of the international terminal. This is their flagship lounge and it has plenty of seating broken up into different areas so noise doesn’t travel and to give a more private feel. It also has free wifi, conference rooms, showers, a business center, and of course self-serve bar and hearty snacks. The drink spread was very good, but the food was superb. Air Canada’s lounges have some very good soup offerings and this was no different. There was also some very tasty pasta available that reminded me of grandma's. I left briefly to find my friend and check out the duty free prices. We were able to locate each other and went to the lounge for a pre-departure toast to our trip. Our flight had a maintenance delay, so we were able to make a few more toasts before departure. The aircraft for the trip to BCN was a 767 that Air Canada had not converted to the new business class and video on demand in coach. The seats also were not very comfortable, so before we pushed back, I knew I was in for a long trip. Leg Room in Coach on 767, Where's the TV? 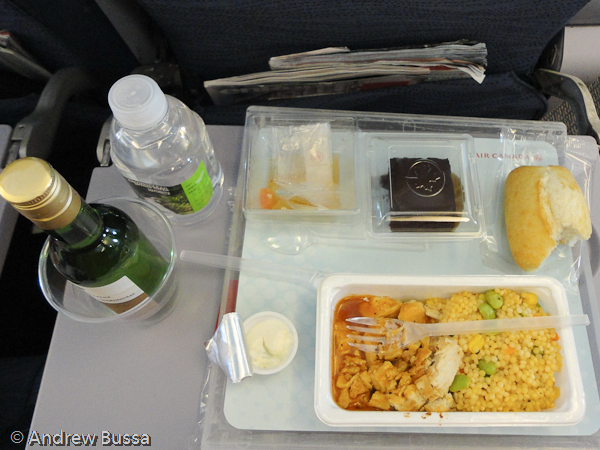 The meal service started soon after takeoff and I enjoyed a very tasty chicken dish. The brownie was also very good. Soon after dinner, I tried to sleep. It didn’t go well. I went to the back of the plane to see if any sets of 3 seats were open to lay down on, but enough people already had that idea and I was out of luck. I wound up taking a set of two free seats, built a pillow fort, and tried to fall asleep. I don’t know why, but nothing worked. I might have been out for 30 minutes tops. After a seemingly endless struggle, I spotted land (Spain looks like the American southwest from the air) and we started our approach. Landing took us over a few sights and we quickly taxied to the gate, so fast that the crew hadn’t finished the French version of the announcement. I was soon off the plane, not rested at all, but excited to experience Barcelona.